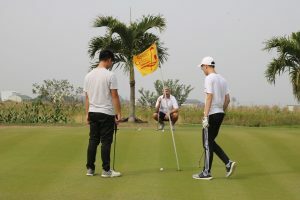 As the semester winded down, the foreign teachers thought it would be nice to gather all the golfers in the group and go hit 9 holes at the Cigu golf course in Qigu district. The course, Spring Garden Golf Ranch & Resort is a nice 9 hole track tucked away amidst the sugarcane fields in the once a salt producing district of Qigu, north of An’nan district. The course features some challenging, over water hazard tee shots and some undulating greens. You don’t need to have a long ball to play here, there is only one par 4 at a distance of 270 yards from the tips. 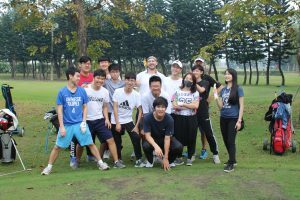 The students and teachers had a friendly competition with two students who have both played professionally as they went head to head in match play. Daniel and Kevin tend the pin for teacher Jeff’s putt. Group photo at the end of the round.